"...there is ministerial responsibility in this matter. This is a grossly serious matter which has been reported to the Financial Regulator. A man has lost his job as a result. He honourably resigned. The degree of breach was 40 times the accepted margin. This is a disaster. If we are not prepared to face the issue and investigate it when it has been laid before the House, there is absolutely no hope for the financial system or its reputation worldwide...How can the Financial Regulator investigate himself? He was in breach of his responsibility." 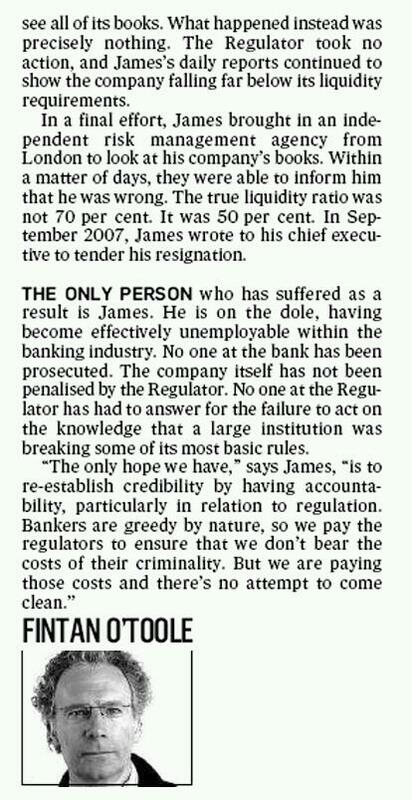 I am 'James' in this article. have stopped oﬀ to learn the big lessons – like that our vision of the future needs to be sustainable and compassionate. climate-change scepticism [p56], institutional abuse [p38] and nepotism in the cultural sector [p64]. multinational corporations prevails. For many the solution is a return to the past. But more. Village’s conclusion is that we need to start over again. Normally it is good to start with a clean page but the page in front of us is ﬁlthy. We have to clean it.If there were any sign the authorities were serious about regulation we might let bygones sit. But from the Director of Public Prosecutions (DPP) to the ﬁnancial regulator to the failure to appoint a planning regulator with teeth to the eviscerated Human Rights and Equality Commission we’re not guarding against the dangers of repeated recklessness. payments tribunals and the banking delinquencies, cannot prevail. There must be prosecutability and it must be seen by all. It is a fundament of our criminal law, recently conﬁrmed in the High Court, that the public, acting as ‘common informer’ may initiate criminal proceedings. If the proceedings are treated summarily they proceed to verdict led by the common informer; if on indictment, the DPP may take them over after the return for trial.Village is asking the DPP to signal the initiation of prosecutions against some of the most obvious potential defendants from the tribunals and banking debacle. These include UniCredit Bank, John Bowes, Michael Fingleton, Michael Lowry, and the protagonists in Monarch Properties found to be corrupt by the Mahon Tribunal. with evidence to come forward, and perhaps engage in fundraising. internal cultural reasons. In those circumstances it falls to private citizens to assert the democratic imperative of prosecutions in a state whose failure is largely attributable to the machinations of a quantiﬁable few. Village is not looking for heads on sticks, it is not asserting the guilt of anyone (it defends the central presumption of innocence), it is taking the clear position that there appears to be enough evidence that people such as those cited above should at least be prosecuted. Never have institutional minds needed more to be concentrated. It has been clear for some time now that the ideal of equality before the law has been buried. The US. Department of Justice made it clear a few months ago, after it had declined to press criminal charges against a string of banks (Citi, Wachovia and HSBC), that ‘Too Big To Fail’ meant while such institutions could be investigated and fined, they could not ever be found criminally guilty, because that would endanger their continued survival. Thus TBTF equals TBTP. The list of G-SIFI’s (Globally Systemically Important Financial Institutions – both banks andInsurers) is therefore a list of those financial institutions that are now above the law. If it profits those institutions, and those who own and run them, to disregard the law, they can and will because all they face is a fine. A fine is just another marginal cost of doing business. A tax. And a small, discretionary one at that. In Europe we have had no similarly outright admission by the State that TBTF means TBTP. Instead the G-SIFI lists of banks and insurers have been published without anyone in government caring to make it clear that the State has taken it upon itself to raise the golden financial class above the law. Of course there is one loophole – just a tiny one and one that is easily ignored – but one nevertheless. And that is that if no Public Prosecutor will take a Bank to court then it is still possible for an ordinary citizen to do so (Of course how easy or impossible it is depends on the country). But In Ireland it is possible and one man, Michael Smith, has decided to try. Michael Smith is a former barrister and the owner and editor of The Village magazine in Dubiln. He, like me and many others, has had a long interest in the on-going case of the UniCredit whistleblower, Jonathan Sugarman, AKA WhisteblowerIRL. It was Mr Smith who accompanied Mr Sugarman when he went to to talk to the Irish authorities about what he knew. It was at that meeting that Mr Sugarman was told by the authorities that they might well prosecute him if he told them about the crime over which he had resigned from UniCredit, whereas they could not promise to prosecute the bank. For those of you who don’t know, the crime in question is actually very straightforward. Mr Sugarman’s job as Risk Managere at UniCredit, was to make sure the Bank was solvent at the end of each day – to check its liquidity. Mr Sugarman became alarmed when he found, at the height of the Bubble, that UniCredit was in breach of its requirements. Not by just a little but by huge sums, and not on one rogue day but regularly. The Irish Law is very clear. 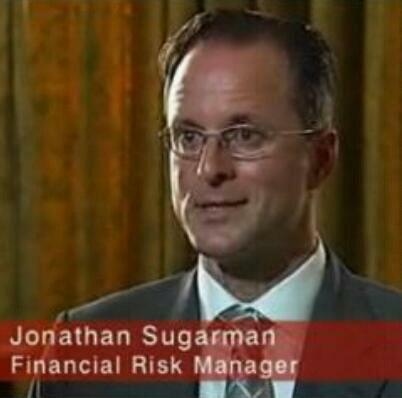 It was Mr Sugarman’s job to tell his bank and the regulator of the breach. This he did. The bank told him to shut up. The regulator ignored him. Of the very few concrete actions taken by the authorities perhaps the most symbolic was that they removed from the Central bank’s web site the document in which the law can be seen. You can however still see the law for yourself, here in sections 9.4 and 10. Sickened by this attitude Mr Smith, in consultation with Mr Sugarman, has decided if the Irish DPP will not insitute an investigation/prosecution against UniCredit Ireland and several other Irish based banks such as Anglo, then The Village will. In an open letter to the Irish DPP Mr SMith calls their bluff. Essentially he asks is the Irish state’s legal aparatus whoring for the banks or does it still have a single grain of honour left? You can read the editorial here. The whole article is only available in the latest print issue. You can read the two previous articles he has written about the Sugarman/UniCredit affair here and here. It comes to somthing when ordinary people have to uphold the laws because their government refuse to. But that is where we are, not just in Ireland but in all of our nations. It remains to be seen what measures the banks and their friends in government will be willing to take to close off from the people from any hope of legal and peaceful redress. 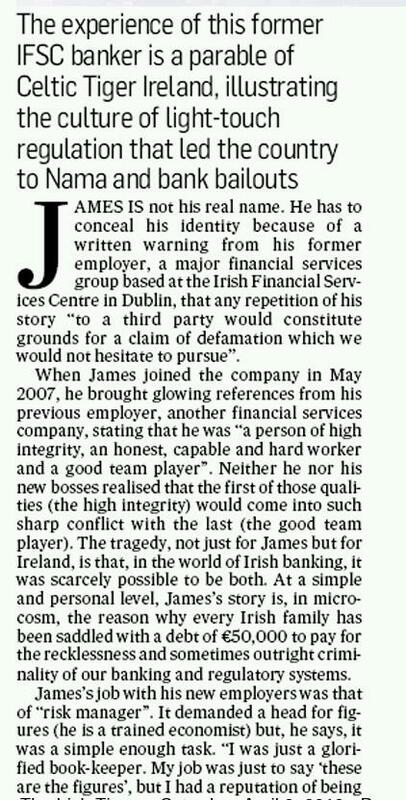 I sincerely hope Mr Smith does file suit against Unicredit, Anglo and the others. I hope people are able to support him. Perhaps we, in other countries, can hope to do the same. Most fervently I hope the government in Ireland and the Trioka in Bruselles do not close down this hope of redress. My name is David Malone. I am a second generation documentary film-maker. My father made The Ascent of Man with Bronowski, The Age of Uncertainy with Galbraith and Cosmos with Sagan. I learned my craft at the BBC science department where I worked for 9 years, ending up on Horizon. Since then I have made films for C4, BBC2 and more recently BBC4. Nearly all Ireland’s banks breached liquidity requirements, leading to the lack of liquidity that the government provided a guarantee against, and which ultimately emerged as the insolvency that bankrupted the country and immiserated the next generation. Failures at the Regulator and in the Central Bank contributed as much as anything to this bankruptcy. The public is entitled to know that these well-paid and cosseted functionaries have learnt lessons and are now demonstrating the most stringent and scrupulous standards. 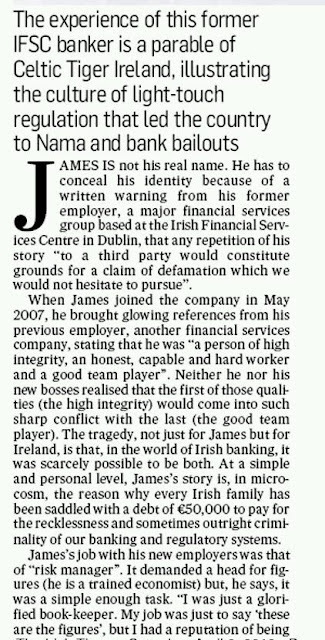 It’s interesting then to know how they treated the most important whistleblower in Irish banking history. In December 2010 a risk-manager in the Irish unit of UniCredit, Italy’s largest bank, described in Village how in 2007 the Financial Regulator failed to intervene after he first alleged he falsified liquidity-ratio figures. The risk-manager maintained he was specifically warned by senior personnel at the Irish subsidiary not to report the matter to the Financial Regulator, even though sound banking depends on maintenance of these ‘liquidity ratios’ which are crucial to the ability of the company to deal with losses of confidence. The liquidity ratio should be no less than 90 per cent. 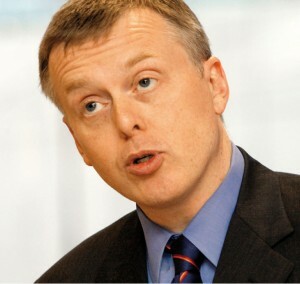 At UniCredit it was calculated at an extraordinary 50 per cent. A ratio of 89 per cent would in normal circumstances be deemed problematic. In banking terms this is like paying with a two-euro note. Jonathan Sugarman blew the whistle on the massive repeated breaches. This magazine received aggressive threats from McCann FitzGerald solicitors on behalf of UniCredit not to publish the information. 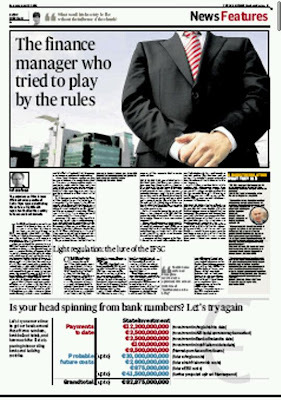 The new ‘poster-boy’ regulator, Matthew Elderfield, stated in response to questions from the Sunday Business Post, and the Süddeutsche Zeitung, a respected German newspaper, about statements made in the Seanad by David Norris which backed up Sugarman’s account, that “our records do not match the description of events given by Senator Norris nor did we receive what might be described as a ‘whistleblower’ letter. We can, however, confirm that an overnight liquidity breach was reported by an institution around the time in question. The matter was followed up with the institution and rectified to the satisfaction of the Financial Regulator at the time”. For someone in whom so much public good-will has been invested, this is remarkably disingenuous, though certainly true. The Regulator’s records presumably do not match Senator Norris’s because its agents didn’t look hard enough or take a proper record; and the Regulator did not receive a whistleblower letter as the letter came from UniCredit itself, which limited its declaration to one overnight breach. Notably, nothing the Regulator said undermined the credibility of the risk-manager. 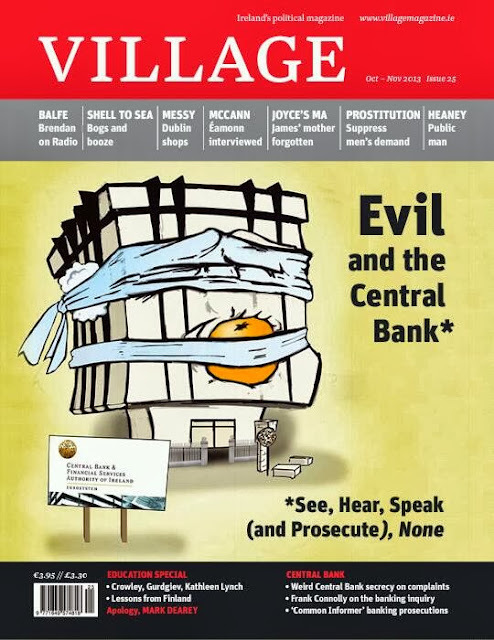 Largely as a result of the story in Village which named the bank, the Central Bank said it would conduct a review of the case and invited parties with information to share it: “if any party has specific information they wish to draw to our attention in this matter it will be treated on a confidential basis”. Things dragged out but in February 2012 the risk-manager attended a meeting with the office of the regulator. 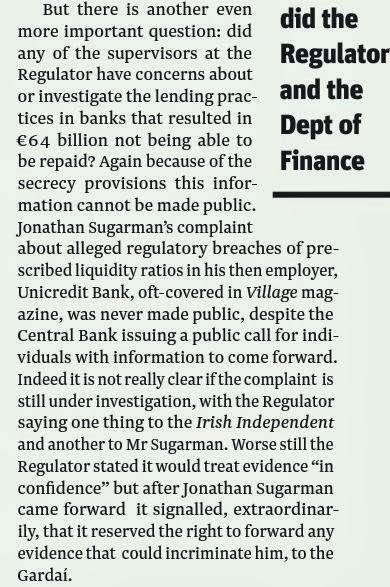 Scandalously the bank’s offer of ‘confidentiality’ was revealed under pressure to be spurious when it insisted that it wouldn’t be enough to shield Sugarman against self-incrimination in the event his own actions constituted criminal activity. 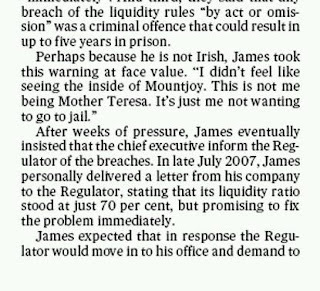 The Central Bank insisted it must forward information to the DPP if there were evidence of a crime. This highlights the need for whistleblower legislation to protect insiders who tell their truth – and particularly that legislation should be retrospective, so it would embrace cases like Mr Sugarman’s. 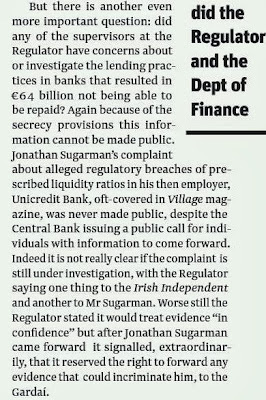 In June, the Central bank informed Mr Sugarman, without giving reasons, that the matter was closed and only after Mark Keenan raised the affair anew in the Irish Independent in September, did the Central Bank finally furnished minutes of the meeting it had had with Mr Sugarman. This was six months after the original meeting. For some reason Mr Keenan is no longer writing on these issues in the Irish Independent. Matthew Elderfield and his office are doing no favours to EU banking regulators, or to the world’s banking and economic system, in being disingenuous about liquidity breaches at the elusive UniCredit. If there is a desire not to frighten the horses just while our bailout is under review, it is misplaced. The lesson of recent history for this country is scrupulousness and openness. There is a general official view that Ireland’s ethical delinquencies are in the past. Deviant planning stopped when the tribunals started; and bad banking regulation stopped with the demise of Pat Neary. In fact this is not so with planning as we have seen with the kicking to touch of John Gormley’s reviews of planning in six counties. Scrutiny of what happened in banking has been limited to two innocuous reports by Patrick Honohan, Peter Nyberg and Klaus Regling. These notably failed to attribute blame or to deal with how liquidity ratios were breached all over financial Dublin with no comment from the usual over-paid auditors, and no sanction. Inconveniently for a country that has started to see corruption and regulation in black (then) and white (now) terms, the general view may not reflect the reality. Without proper scrutiny we cannot be sure either way. Like bad planning, bank under-regulation was a manifestation of this country’s ineradicable tendency to pander to vested interests and to the short term. It is time we got to the bottom of what happened in Irish banking. Scrupulous investigation of Mr Sugarman’s allegations would be a symbolic good start. UniCredit breached liquidity requirements in 2007. Matthew Elderfield nods. The interconnectedness of banking dysfunctionality. Klicken Sie hier, um zu meinem deutschsprachigen Blog zu gelangen. Dieser ist vorerst noch weniger umfangreich als die englische Version und konzentriert sich auf Links in deutschen und österreichischen Medien (inkl. offizielle Webseiten wie diejenige des österreichischen Parlaments). Παρακαλώ πατήστε εδώ για να δείτε το blog στα ελληνικά. Μόλις έχει δημιουργηθεί, αλλά θα προστίθεται συνεχώς νέο υλικό. 'UniCredit Bank Ireland reclassified €3bn of assets' - Kathleen Barrington, 19 Dec. '10. Quote: "The Irish subsidiary...reclassified about €3 billion of assets. This meant that those assets did not have to be valued at market prices which were then in turmoil." 'Still waiting for the truth from the regulator' - Village magazine, Dec-Jan edition. This cover-page article demands answers from the Irish Regulator in relation to the circumstances of my resignation from my position as UniCredit Ireland's Risk Manager. This article reveals aspects of my story which have not been made public until now, notably the link between the bank and Fianna Fáil - Prime Minister Cowen's party. 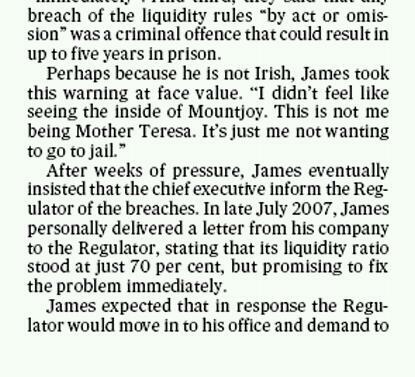 'Bail-out document runs dry on liquidity' - Financial Times, 29 Nov. '10. Quote:"Another oddity of the EU/IMF bail-out is its stance on bank liquidity, the short-term financing vital to ensure the banks still do their core job of funding the economy...An element of the bail-out should have been specifically targeted at plugging the liquidity gap, if only to signal an acknowledgement of how crucial a role it has played in undermining the global system – in IRELAND, just as it did during the big bank failures in the UK (Northern Rock) and the US (Lehman Brothers and Bear Stearns)." Northern Rock collapsed the same month that WhistleblowerIRL resigned. 'Ireland looks to Persian Gulf to buy its banks' - Tehran Times, 12 Dec.'10. Quote: "John Bruton, a former Irish prime minister (Fine Gael), is leading a delegation from the country on a whistle-stop tour of the region as Ireland prepares to sell assets.". This would explain why Fine Gael, one of Ireland's leading 'opposition' parties, has kept silent on WhistleblowerIRL's case. 'US embassy cables: Washington warned Ireland being a 'bit optimistic' about banking prospects' - The Guardian, 14 Dec. '10. Quote: "Clarke... said that it is "likely" the regulatory system would move from one that relied heavily on bank management working within broad guidelines laid down by the regulator to a "rules-based" one." 'Court filing is a blow to UniCredit chief' - Financial Times, 11 Dec. '10. Quote: "The lawsuit also comes against a backdrop of increasing nervousness among investors about Italian banks in the light of new Basel III capital rules and eurozone sovereign debt concerns." 'New Madoff suits seek $40bn' - Financial Times, 13 Dec. '10. Quote: "The biggest lawsuit, against UniCredit and long-time Madoff associate S. Kohn, accuses them of participating in an "illegal scheme" to send money to Mr. Madoff". 'Italy: Roman showdown' - Financial Times, 13 Dec. '10. Quote:"One grim certainty for Italians is that with a national debt close to 120% of GDP - and, at $2,380bn, more than the debts of Portugal, Ireland, Greece and Spain put together..."
"I'm only too aware that we could easily cross the line and loose everything we have" said Mario Draghi, Governor of Banca d'Italia in Friday's Financial Times (10 Dec. '10). WhistleblowerIRL wonders if Draghi made this statement because he knows that UniCredit is a ticking time-bomb? My comment on Paul Krugman's recent column about Ireland in the New-York Times. It is a summary of my story.